Glutamine is the most abundant single amino acid in the blood and in the intracellular free amino acid pool (most abundant amino acid in muscle tissue). It comprises 61% of the amino acid pool in skeletal muscle. Glutamine’s unique structure, containing two nitrogen side chains, consists of 19% nitrogen - making it the primary transporter of nitrogen into the muscle cell. In fact, glutamine alone is responsible for 35% of the nitrogen that gets into the muscle cell. Glutamine literally drives muscle building nitrogen into the muscle cell where it is synthesized for growth. Enough can't be said about the importance of glutamine and muscle metabolism. Research is showing an important link between stress and your body's need for glutamine. 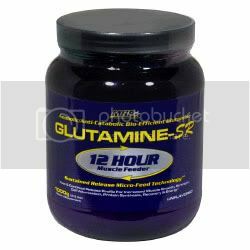 The greater the stress (weight training) the more your body needs glutamine. If you don't receive enough glutamine from your diet your body will steal it from the largest glutamine reservoir in your body - skeletal muscle tissue. So if you don't satisfy your body's glutamine demand either through the food you eat or from supplementation, it will ravage it from muscle tissue causing a loss of lean muscle mass. One other unique quality glutamine exerts is its ability to dramatically increase circulating growth hormone levels.